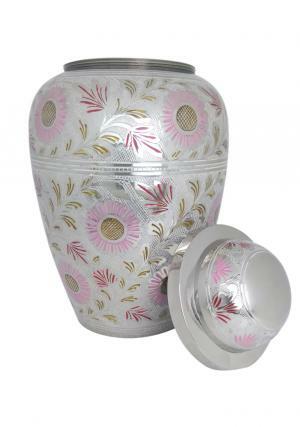 Pink & White Floral Adult Memorial Urns for Ashes is brass made metal urn with silver white alloy finish and engravings of Pink flowers. 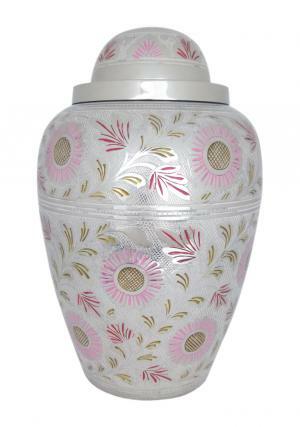 The Floral Adult Urn is beautifully crafted in gold and pink leaves with white band decorated around the urn. 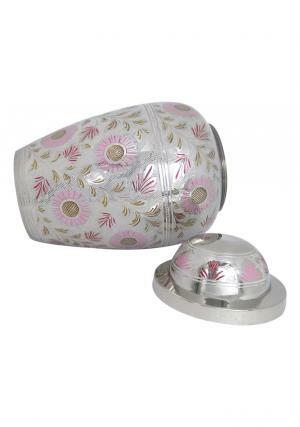 The Engravings are also part of lid with pink floral sculpture and laid golden leaves threaded around the flower. Screw threadings are laid across the inner portion of the lid for an easy closure and secure the ashes tightly within. Pink & White Floral Adult Funeral Ashes Urn measures to carry 200 cubic inch ashes that stands 10.7 inch tall, width as 6.9 inch and weighs 2.24 kg approximately.